Huron comes from French pronunciation of Wyandot. The standard ball war club was made from tree roots. The later standard ball war club was made from gun stocks retrieved from damaged guns. The larger end of the standard ball war club was used for hitting the skull; the smaller end was used for splitting the skull. The standard ball war club was called an effigy club. It was left as a calling card after a killing, property burning. Native American Todd Johnson, whose Huron name is Ghost in the Head, was dressed in traditional Huron garb during his interactive presentation at the Living History weekend, sponsored by the Compass Inn, on July 22, 2012,. The Laughlintown, Pennsylvania, inn is a restored 1799 stagecoach inn. Ghost in the Head is Todd’s actual Huron name, not the name of a character he portrays. He is a member of the Federal Advisory Commission and the Long Range Interpretive Planning Committee for Fort Necessity National Battlefield. He works with other Hurons, using cultural immersion to train scouts and teachers about the Native American culture. Decorations on the medicine bag were made from porcupine quills: they are softened in water, shaped, dried. Contents of a Native American’s medicine bag are secret in order to retain their power. White wampum beads were originally made from quahog shells. 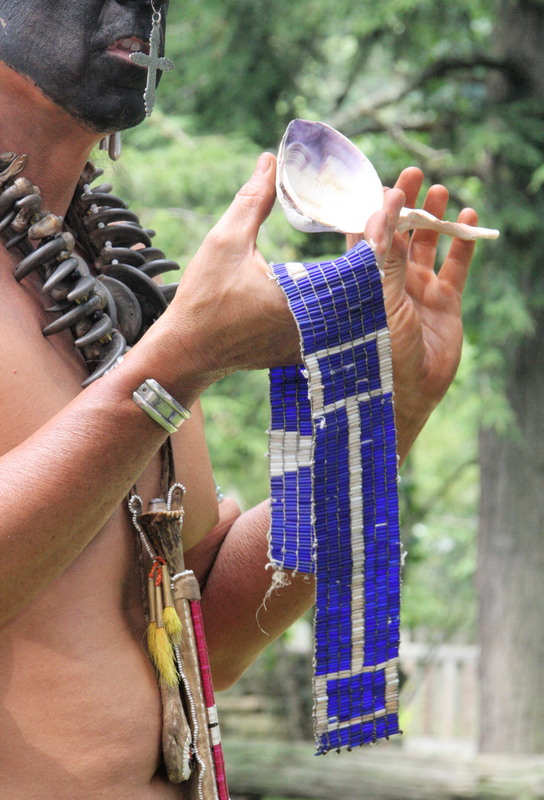 Blue wampum beads were originally made from conch shells. Blue was more valuable that white because it was more difficult to produce. 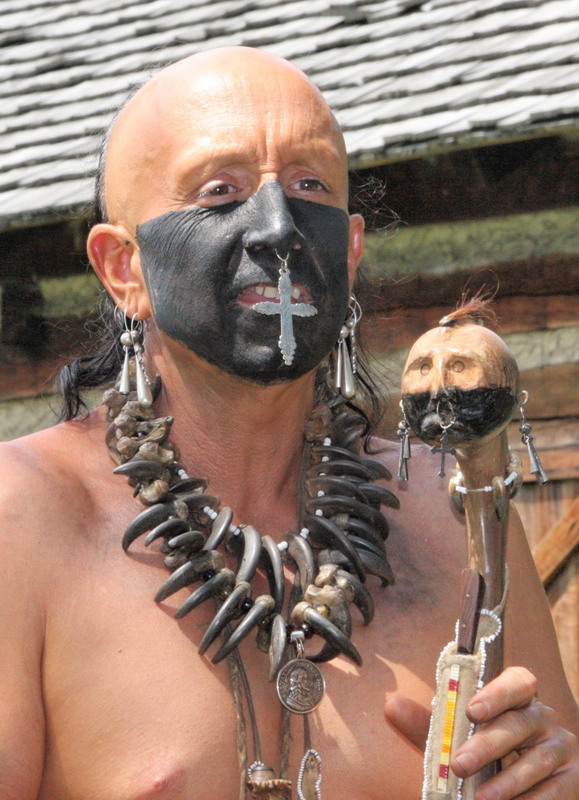 Native American men remove the hair from their bodies because they may have tattoos. Also, the hair interferes with the use of body paint. Body hair is removed using tweezers made form little shells found on stream banks or from hardened wood. The Europeans brought a new tool. The term redskin is not necessarily derogatory. The Native American’s continual use of red paint stained the skin. Yellow paint was colored using yellowroot or cattail pollen. The cattail is a food source. Pollen is used as a flavoring. The root is like potato. The stalk is like celery or asparagus. The pompom is like the hot dog. Cattail leaves and stalks were useful in making dwellings. Europeans were obnoxious, but brought stuff that made life easier for the Native Americans. Flint is an example. The Europeans weren’t always so smart. For example making their canteen from wood meant: they cut the tree; sawed and shaped the wood; used the blacksmith for metal bands and nails; lined the canteen with pitch that had to be kept wet to prevent leaks. The Native American canteen was made from a gourd, which was grown, cut, cleared out, doesn’t leak. The bonus is being able to plant the seed the next year.. Traditional Native American foods: corn, popcorn, cracker jacks, maple syrup, snow cones, chewing gum; non-carbonated root beer and birch beer; potatoes, tomatoes, chocolate. You cannot waterproof animal skins, but you can make them water resistant by rubbing them with beaver oil or beeswax. There is no warmer clothing than animal skins. Europeans gave Native Americans long-legged socks, which were viewed as premade bags by the Native Americans. They were porous which decreased mold growth in the food they carried. I’m sorry, Ghost In The Head looks white, not full Native American. And, according to my great-grandmother, who was half Blackfoot, it is only the very far north tribes that have facial hair. Most full Native American men never grow mustaches, or beards, or thick sideburns. Some will, however, have thick eyebrows. he may be white looking, sherri, but if hes wyandot hes wyandot. im sure your grandmother also wasnt blackfoot. if she told you that then shes never met any natives. any native man (full blood or not) can grow facial hair. you cant just generalize people like that. and redskin is a derogatory term because even though we wore lots of red paint, redskin was the term for using when european scalp hunters brought back indian scalps. My great-grandmother grew up on a reservation. Don’t ever insult me by saying my grandmother lied, when there’s now documented proof. And, look up the facts of the matter. It’s been known since before I was born that a full-blooded Native American (aside from some Algonquin & Inuit) do not have facial hair. Even Anthropology did an article. Safety systems these days may do just about everything save for apprehending your property’s brazen intruder.